‘Dear Basketball’ is a short production based on a poem Bryant wrote in 2015, announcing his impending retirement from the sport. 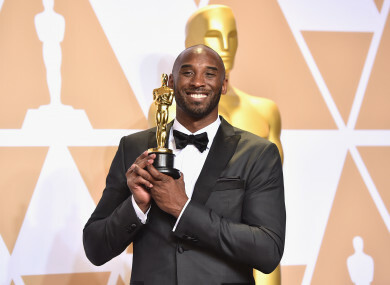 KOBE BRYANT HAS won an Oscar for a short movie about retiring from basketball. The movie is based on a poem he wrote in 2015 to announce his impending retirement from basketball, which was published in The Players’ Tribune. Bryant was the executive producer for the animation, and shared the award with Disney animator Glen Keane. In addition to honouring those who helped him make ‘Dear Basketball,’ Bryant also thanked his wife and daughters for their support. Bryant’s former club Los Angeles Lakers retired his jersey numbers 8 and 24 last December at a ceremony where Magic Johnson declared Bryant to be the ‘greatest’ LA Laker of all. Bryant played 10 seasons in each retired number, winning three titles in the single-digit uniform top and two in the higher number jersey. He retired after the 2015-16 campaign as an 18-time All-Star, a 2008 NBA Most Valuable Player and two-time NBA Finals MVP, two-time NBA scoring champion and two-time Olympic champion. Email “Watch: Kobe Bryant wins Oscar for short animation about retiring from basketball”. Feedback on “Watch: Kobe Bryant wins Oscar for short animation about retiring from basketball”.